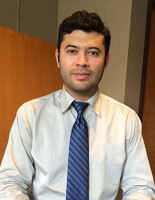 Josue coordinates inter-office communications; he is responsible for day to day correspondence from the office. He works with Alison on creating content for the website and designs its many interactive interfaces. Furthermore, he designs the organization’s print materials. His main duties include book layouts and covers, monthly magazines, annual reports, and brochures as well as updating the organization’s website. Before joining the SIMN, Josue worked non-profit here in NYC, developing and creating editorial designs. Josue has BS in Graphic Design from Queens College, City University of New York, and an AAS in Digital Arts from Queens Community College, City University of New York, both in Queens. He speaks English and Spanish.